How should you police their children on the internet when you’re not a computer crimes detective? Here's what an NYPD detective does to keep his own kids safe. Children are living in a dangerous online world packed with predators, and parents must be vigilant to keep their children safe, according to Det. Andrew Shore of the NYPD Computer Crimes Squad. "Children are exposed," said Shore. "We get hundreds of tips a month. Some of the cases really get to you." The number of child exploitation tips to the National Center for Missing and Exploited Children doubled last year to more than 18 million. Don't let them use social media. "I lock my kids out of it," said Shore. "My children don't have social media, which probably isn't a good answer for everybody, but you know, I monitor what they do online." If you do allow them to use social media, you should know what their account name is. You should also be friends with them on the account so you can see what's going on back and forth. 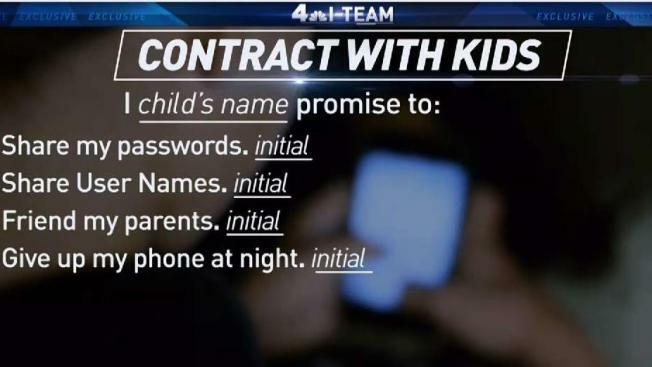 Develop a contract with your kids setting strict rules for cellphone use and online conduct. A good contract might include a clause requiring your children to come forward if they've broken the rules and gotten into trouble -- but parents need to promise not to freak out. "On the contract it says, 'I'll never take photos that I wouldn't want my grandma to see.'" Don't let children keep a phone overnight in their room. "I have my children put their phones on a charging system in a common area, where we can see at night, 'OK, the phones are there,'" said Shore. Use parental software to help monitor kids' activity. "I think if parents took a more active role in what children do, we would have a lot less problems," said Shore.